Whenever I finish reading a book, I’ll put up a post. Generally speaking, these posts will be capsule reviews–a short synopsis + my impressions of the book. I also have a fun little job where I get to read books before they are published, but I can’t talk publicly about those books for various reasons. So, whenever I finish a book for work, I’ll put up a post in the On Reading category. These will be anecdotes from my childhood as a bookworm and musings on the activity of reading and related topics. Here’s a recent post that tells more about the mission of this blog. 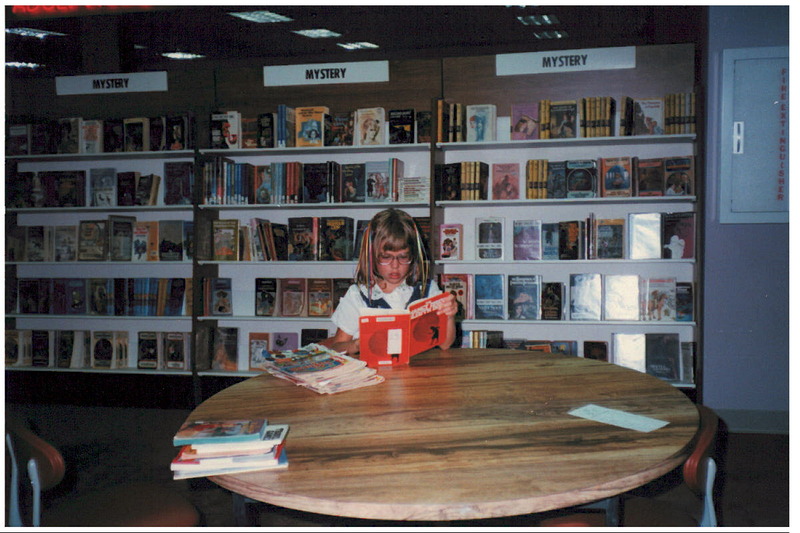 That’s a much-younger me at my favorite place in the whole world–the local library. The rule was I could only check out as many books as I could carry, so I got a big bag. The first full-length novel I ever read was The Princess Bride. I will admit now that I skipped all the meta parts where the granddad was reading to his kid because I didn’t quite get the comedy. That might have been because I was six. I read books for fun and I read books for a living, but the main reason I read is because I’m totally and completely addicted to the written word. I average about 100 pages an hour. Whenever I travel, I always have as many books as I think I will need, plus one in case something happens and I’m trapped there without access to a bookstore. I often buy books while traveling anyway. To be honest, I think I’m stuck this way. My banner is designed by the brilliant and kind Hevan Chan. If you want to donate to this blog, click any of the Amazon links or use the Amazon search box and make a purchase. Thanks!